The LS2 Strobe modular full-face motorcycle helmet offers features you'd expect to find on helmets costing twice as much. The full-metal latch system operates smoothly and offers a super secure closure for safety. It opens with a single button that's easy to find and easy to use, even with a heavy winter glove. The chin bar has a secure detent when fully opened, so it stays in place when open. This modular helmet has LS2's Twin Shield System with a built-in Twin Shield System Sun Shield, so you get the sun protection you want, and can quickly get more light when entering a tunnel or darker area. The Strobe uses a new slide and cable technology to engage the sun shield smoothly, offering ease of use and g less wind noise. The face shield is optically correct, scratch resistant and has LS2's ShortShift Tool-less Quick Release making it easy to change whenever you need. The technical fabric liner wicks moisture, and is removable and washable. This is a motorcycle helmet built for motorcycle riders, whether you're touring the Alaskan Highway, or commuting to work. 3D Laser Cut foam in the cheek pads make for a secure and comfortable fit, and a quick release strap makes it easy to get on and off. The Kinetic Polycarbonate Alloy (KPA) shell is aerodynamic and has fully adjustable ventilation. The LS2 Strobe is so comfortable, you'll forget you have it on. DOT/ECE approved. This model has am INTERMEDIATE OVAL FIT. The LS2 Strobe Modular has a 5-year warranty against defects in material and workmanship. 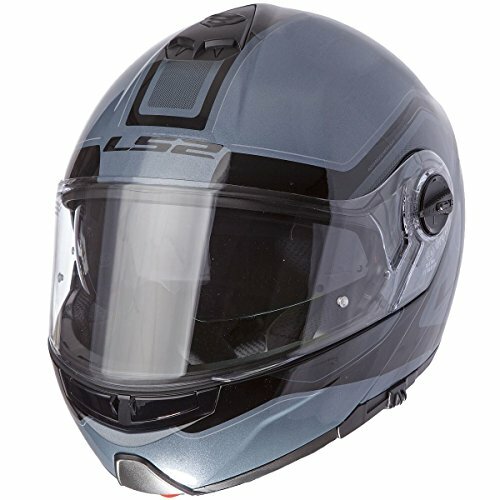 If you have any questions about this product by LS2 Helmets, contact us by completing and submitting the form below. If you are looking for a specif part number, please include it with your message.